The other day I found myself buying two books at the same time: “I Quit Sugar” by Sarah Wilson and “Saved by Cake” by Marian Keyes. I am aware of the irony. Unfortunately both appeal to me equally. For at least ten minutes I decided I absolutely would give up sugar for good. Then I realised that I could either bake cakes for a living or give up sugar but not really both at the same time. Not to mention that although I don’t, surprisingly, have a particularly sweet tooth, I do love a good cake. So I consoled myself by looking through the recipe book by Marian Keyes, the international best-selling novelist, who was literally saved by cake when she took up baking in the midst of a deep, dangerous depression. While it hasn’t cured her it, baking has really helped her: baking, and particularly bread-making, can be extremely therapeutic. I can highly recommend it. 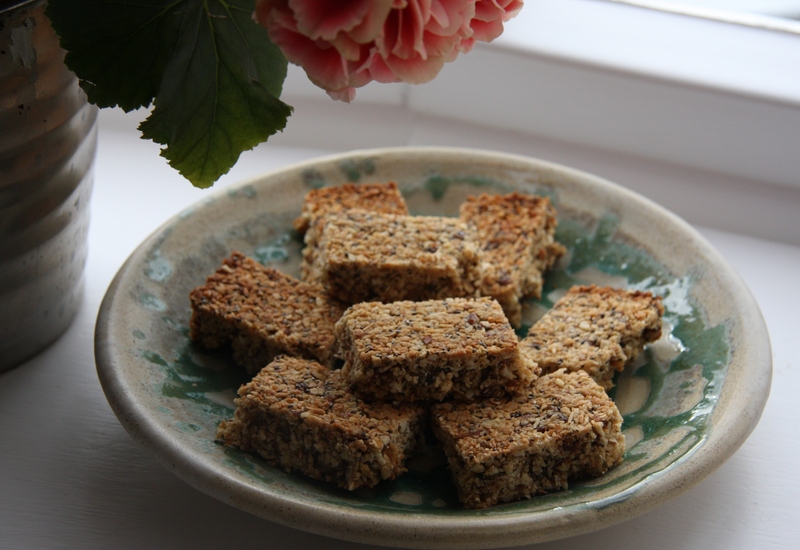 I have been wanting to try these coconut and chia oat bars for a while now, partly because I thought they qualified as a healthy treat and I am trying to be more healthy. Whether or not they are healthy will depend on which variation of healthy you believe in. Because although these bars contain chia seeds, oats, coconut, almonds and cinnamon, all of which are currently on the “superfoods” lists, they also contain brown sugar, honey and dates. So while they are considered much better options than white sugar, they are still all sources of fructose. I have always been a believer in everything in moderation (even if I don’t always practice what I preach), so for now, at least, sugar is staying in. We all have a good idea of what we probably should and shouldn’t be eating, although that’s not helped by the fact that just because it was good for you last week doesn’t mean it will still be good for you next week. I work on the theory that if I cut out as many processed foods as possible I can avoid a lot of the dangerous trans fats, high fructose corn sugar, palm oil and sugar, additives and preservatives in food as well as “processing aids”, which are not even on the label. And I have friends who range on the scale from those who are almost evangelical about what we should and shouldn’t be eating to those who subsist on a diet of wine, crisps and chocolate: there is always room for discussion! 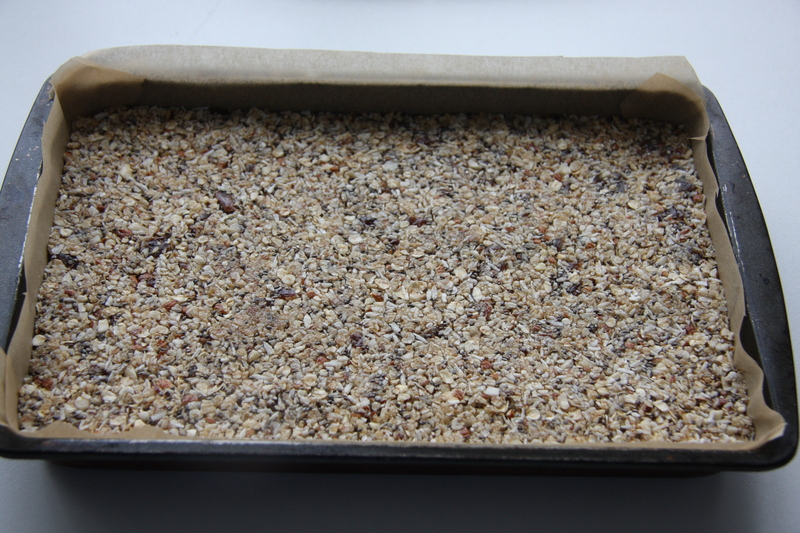 Set the oven to 180ºC and line a baking tin approximately 20x30cm with baking parchment. 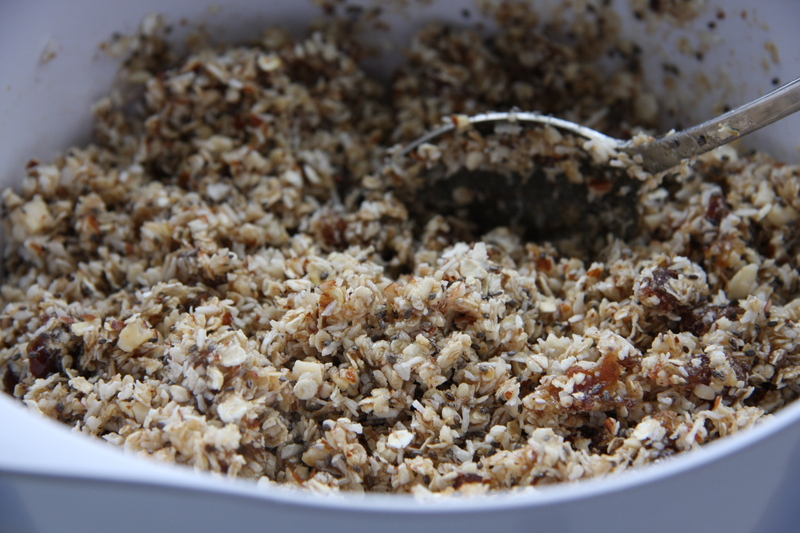 Combine the oats, desiccated coconut, chopped almonds, chia seeds, chopped dates and cinnamon in a large bowl. 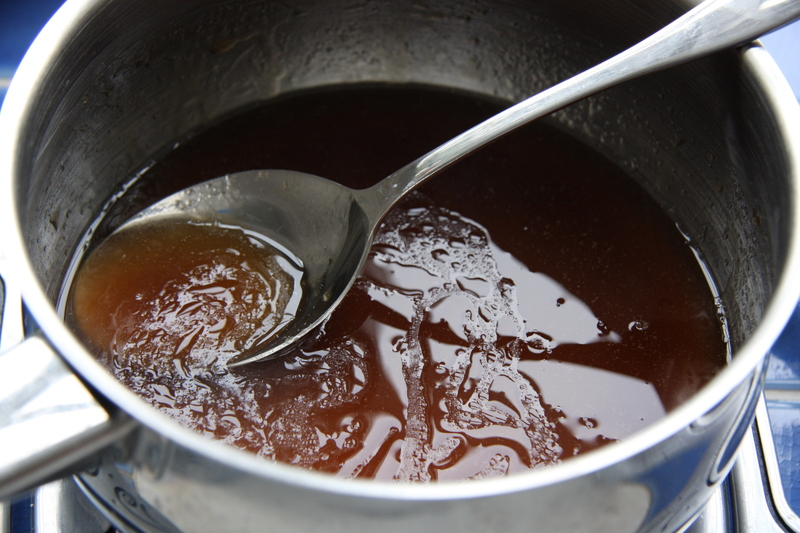 Put the coconut oil, honey and sugar into a saucepan and heat gently until the ingredients are melted and combined. 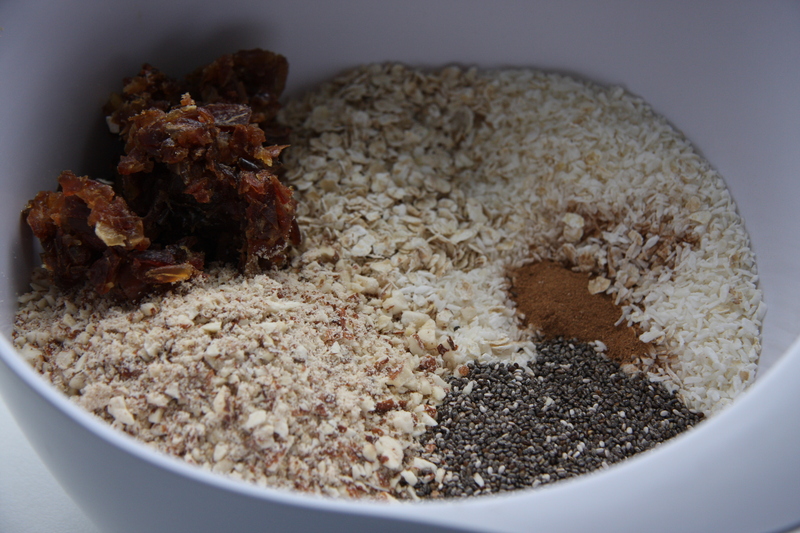 Pour the honey mixture into the dry ingredients and mix well to combine. Tip the mixture into the prepared tin and press down evenly and firmly using the back of a metal spoon. Bake for around 20 minutes or until dark brown. Leave to cool in the tin. Once cold, remove from the tin and slice into squares or bars. They should keep for up to a week in an airtight tin. Can be enjoyed in moderation as part of a healthy diet – probably! I’d love to know what you think. Sounds great. I recently bought some chai seeds and struggled with what to do with them. Kind like the coconut flapjacks I make, and I really love those. These sound fantastic. 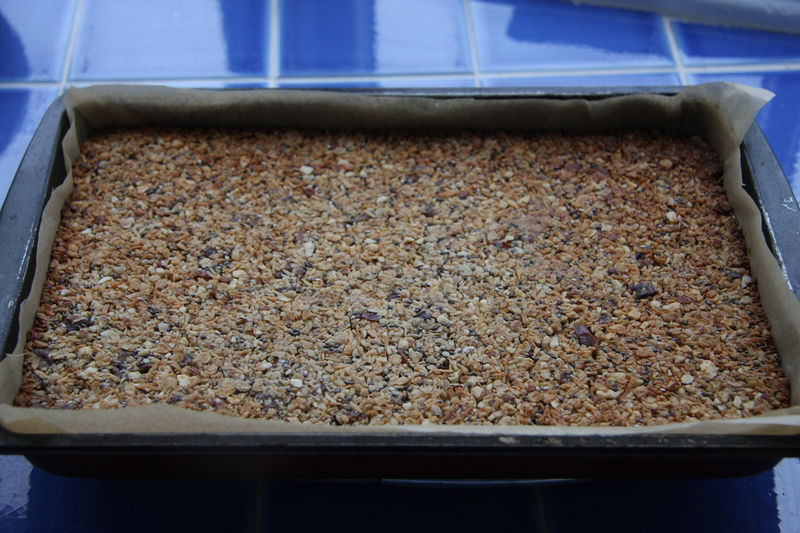 I think it’s good to have numerous flapjack type recipes! Speaking as an older generation, I remember times when brown sugar and honey were good for you and probably dates were too! Wait till next week, who knows…. I couldn’t agree with you more. I would love to cut out all sugars, but equally could not enjoy life with no cake in it either. I still think everything in moderation is probably the way forward! For me this would be labelled as healthy 👍. Fantastic recipe, thanks for sharing. I agree with you that anything eaten in moderation is the best way to go about eating and enjoying what one eats without guilt, with regular fitness schedules added. To give up eating cakes is something impossible for me😃! Thank you very much – have just been for a run and am now enjoying a piece of cake!!! Lol…thanks for making me smile this morning – it IS quite funny and ironic buying those two books at the same time 😉 And they look delicious! Thank you – I would love to be able to give up sugar, it’s just not practical at the moment! Lovely recipe, I too really restrict my sugar intake – but like you I do it through making as much of my food as possible from scratch, which allows for the occasional sweet treat now and again! These sound great. I’ll be trying them for sure. Thanks, hope you enjoy them! I think these are healthy! They look tasty too, I want to try them. I love me some sugar, and I gave giving it up a go but it was some tricky business. Now, I’m trying to cut back – I can’t do the no sugar forever deal! I think cutting back is definitely a more do-able option! These look delicious. I’m with you though I could not give up sugar as I love cakes. It is all about moderation. On 23 March some colleagues and I at work are joining a global exercise challenge for 4 weeks, thought you would like our team name – cake busters. That’s great, good luck – you’ll definitely win with a name like that! I just found your blog, via Natascha, and am glad I did. I am looking forward to trying some of your recipes. I am probably going to start with this one, it would be great for breakfast! Thank you very much, I hope you enjoy them!